The act or the art of tightrope-walking. 1. A performer or an entertainer who walks on a tight rope, a rope-walker, a rope-dancer: Dave's two children were really excited to see the funambulists in the circus; especially, since it would be their first time to see such achievements! 2. 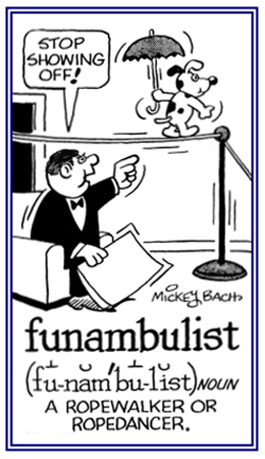 Someone who exhibits a striking performance of mental agility or skill: The best funambulist in Mr. Smith's classroom was Tim, who was able to spell and give definitions for any words in an instant that the teacher asked the students to respond to. © ALL rights are reserved. 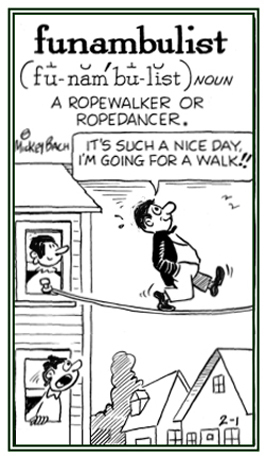 Referring to, or pertaining to, a rope-walker. A fear of walking on or of touching smooth surfaces: Homalambulophobia is primarily applicable to those who have lived in a jungle, mountainous areas, or deep forest environments. To walk or to pace up and down or to walk back and forth. The act of walking or pacimg back and forth. A kind of somnambulism (sleep walking) supposedly as a result of the moon's influence. The act of walking or performing an activity that is normally done as if awake at night, but while asleep or in a sleeplike state. A reference to walking around while asleep at night. To walk or to perform an activity as if awake at night but while asleep. The act or an instance of walking or performing another activity associated with wakefulness while asleep or in a sleep like situation. Someone who primarily walks, or eats, or performs other motor activities while asleep and which the person does not remember having done after waking up. A reference to walking in one's sleep. 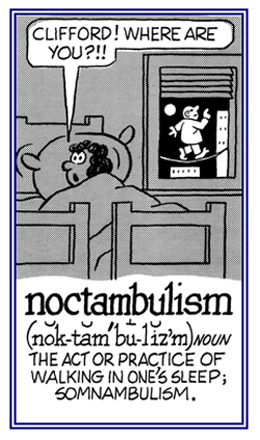 The condition of sleepwalking, getting out of bed and walking around during an apparent state of sleep: Noctambulism, or somnambulism, can occur in the first third of the night and can last for a few minutes and up to a half hour in some cases. © ALL rights are reserved. Showing page 4 out of 7 pages of 93 main-word entries or main-word-entry groups.